If your kids are like mine, they have tons of stuffed animals…so many that they just don’t fit on the bed without taking up too much room. While redecorating my little one’s room recently, I began to wonder what in the world I could do with all of those stuffed animals, so I started looking for some creative DIY stuffed animal organizers. 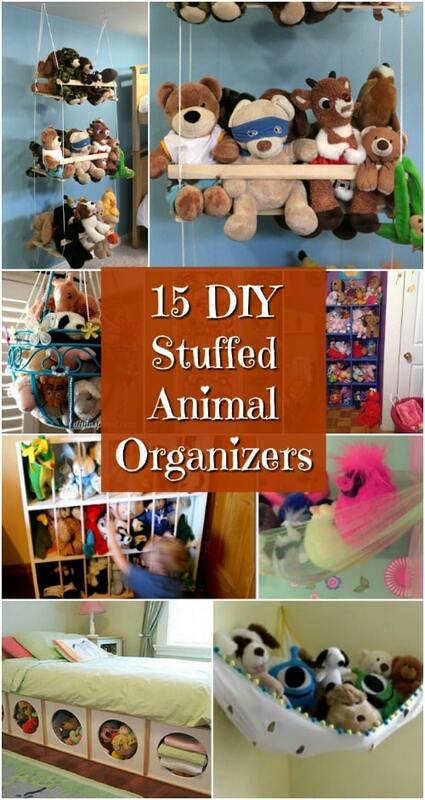 There are so many stuffed animal organizer plans available that I just had to share my favorite 15 with you. These DIY stuffed animal organizer plans are super simple to make and many of them use materials that you probably have on hand. You might want to check out our 50 storage ideas to organize kids rooms post to discover other organizing projects. From stuffed animal bins and cages to DIY stuffed animal zoos, you are going to find the perfect way to display and store all of those stuffed toys, even your adorable DIY stuffed toys. If you are lacking in storage space in your kids’ bedrooms, these easy DIY stuffed animal storage ideas are perfect. Whether you have 10 or 100 stuffed animals to store, you are going to find a great solution, and DIY is what we’re all about, right? 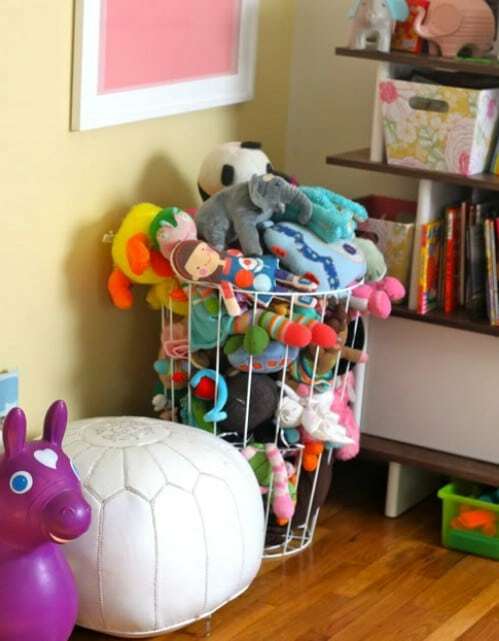 Let’s take a look at some do it yourself stuffed animal storage solutions that are going to help you clean up those kids’ bedrooms and make space for other things…like books and all of those other toys. 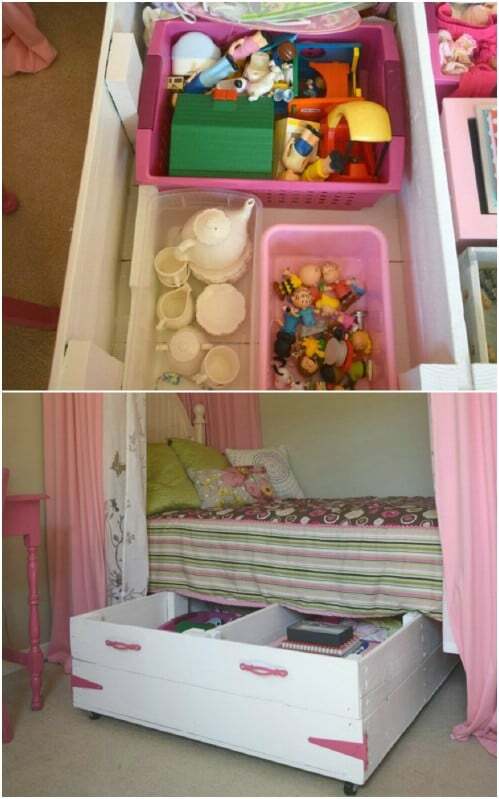 DIY organizing hacks for kids’ toys are great. Not only are these creatively simple DIY stuffed animal organizers cheap, but they really get the job done in a decorative way! For little princesses, this DIY stuffed animal organizer is perfect. It’s made from tulle, so it has an adorable princess look. It’s also super easy to make and your little one will adore having it hanging in the corner of her bedroom. You need about two yards of tulle, which you can get for under $5 and then a few hooks and other supplies to hang it. It’s super simple, super cheap and a super adorable way to create your own DIY stuffed animal storage. 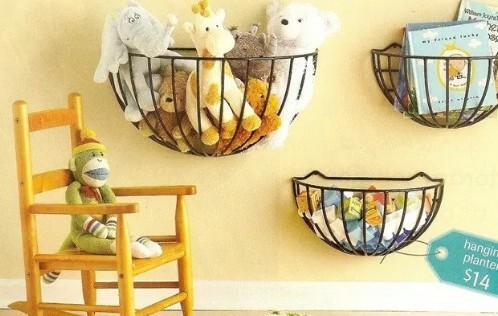 A cheap shoe organizer can be turned into the perfect place to store those stuffed animals. 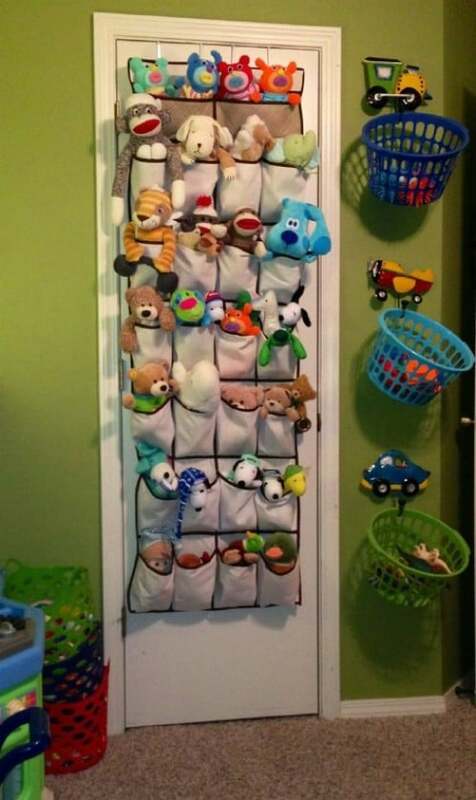 Most of these over the door organizers have enough space for a couple dozen stuffed animals, and they fit over the inside of the closet door so they are hidden away. And, they make it really easy for the kids to grab their favorite stuffed toy when they want to play with it. Not only does this stuffed animal storage give you a place to keep all of those stuffed toys put away, it doubles as a comfy chair for the kiddos. 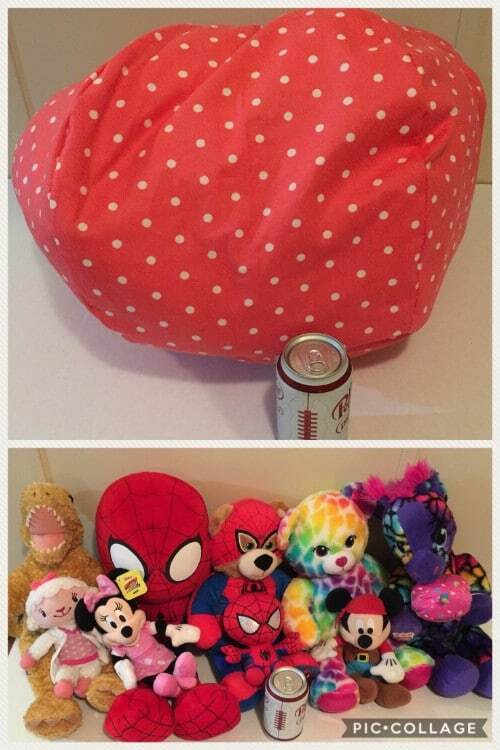 All you have to do is fill a bean bag cover with stuffed toys. Kids are going to love having their stuffed animals right there where they can get to them and they can use the bean bag chair for reading or relaxing. You just stuff it full of stuffed toys and then zip it up. I found this great cover on Etsy, but you could totally make this one yourself if you wanted to. 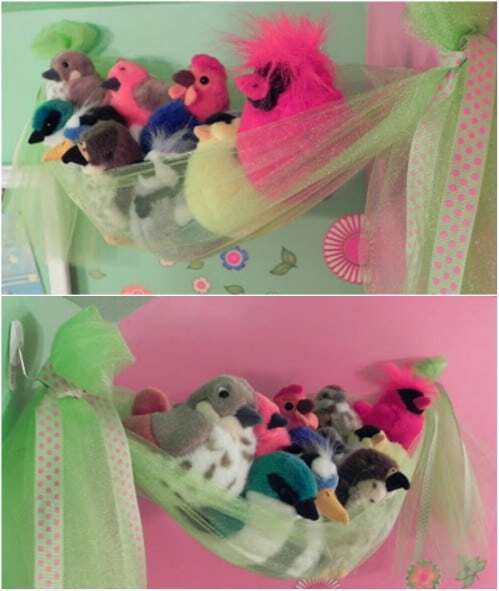 I love the idea of keeping stuffed animals in a net in a corner of the room. Because it’s hung off the floor, you have all of that floor space left available. You could lower this one if your little ones still play with their stuffed animals or hang it high on the wall next to the ceiling if they don’t. This is a great idea for pre-teens rooms and the net is super easy to make yourself and doesn’t take a lot of fabric. This is a good one idea to reuse leftover fabric scraps. A few old hat boxes give you so much space to store those stuffed animals. You can create little individual homes for the animals. These are super easy and if you can’t find hat boxes to use, you could totally repurpose some regular cardboard boxes. Just dress them up a bit with fabric or paint and attach them right onto the wall. And, you can hang them low enough that your little ones can still get to their favorite animals. Head over to the Dollar Store and pick up a few metallic buckets. When you get them home, you can turn them into the most adorable storage and organizers for those stuffed animals. You can hang your buckets directly on the wall and it frees up floor space and space in the toybox. Add in some decorations to your buckets to customize them to match your little ones’ rooms. These old garden baskets can be picked up at any home improvement store or you can sometimes get them at the Dollar Store. 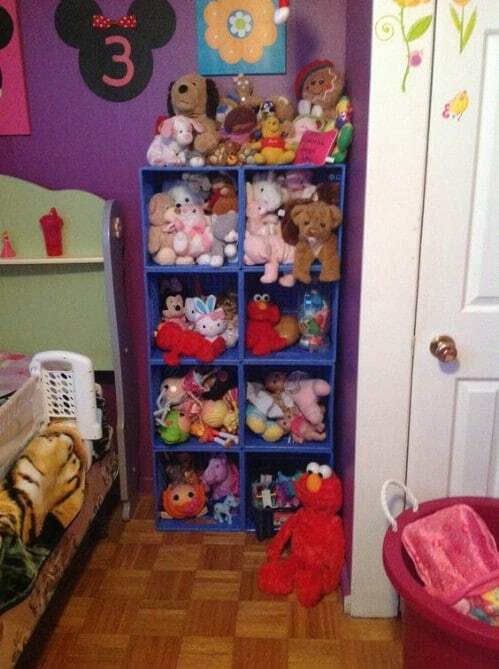 They’re really cheap and make the perfect organizers for your kids’ stuffed animals. You don’t even have to do anything special with these. Just hang them on the wall and add the stuffed animals. And, you can get them in different sizes, so they offer a certain aesthetic appeal, too. 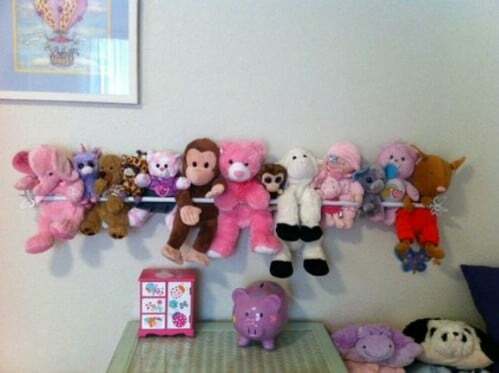 You can turn a curtain rod into a wonderful way to organize and store stuffed animals. If you use an adjustable rod, like a shower curtain rod, you could simply hang it on the wall in a corner. The pressure that the rod creates will keep it in place. Or, you can hang a traditional curtain rod with hangers on the wall just about anywhere and then just stick those stuffed animals between the rod and the wall. I love this little zoo that you can easily make yourself for those stuffed animals. There are so many ways to customize this one and if you have a lot of stuffed animals, you could easily do more than one of these. Separate your animals into domestics and wild animals – your kids will love it! The “bars” on this are made with wooden dowels but I have seen some really cute versions that use bungee type cords to hold the animals in. 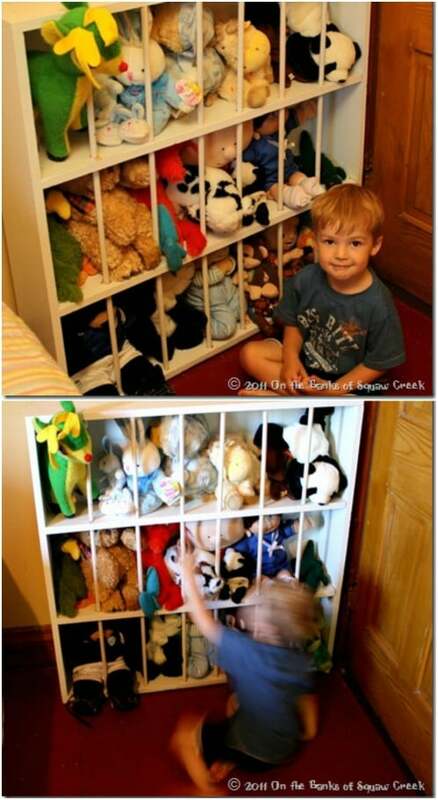 If you really want a creative and easy, not to mention cheap, DIY stuffed animal storage solution, here it is. This one is made with an old planter. You don’t even have to do anything, except maybe paint it if you want to change the color. 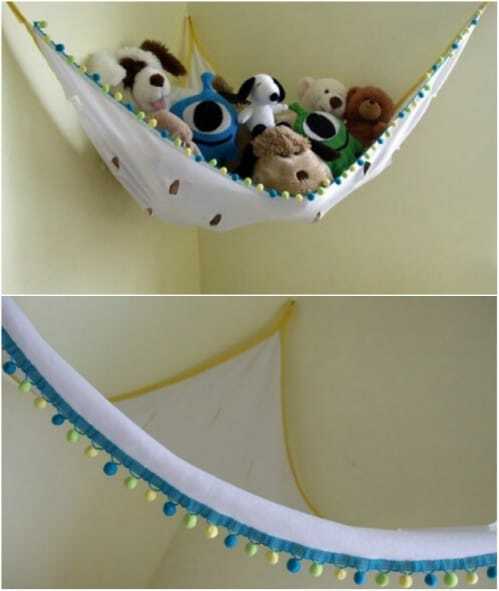 These hang from the ceiling and give your kids so much space to store their little stuffed toys. And, you can normally pick these up at yard sales or thrift stores for just a couple of dollars each. You could even use your favorite DIY hanging planter for this one. If you prefer to keep those stuffed animals out of sight but you still want them to be easily accessible by your little ones, this DIY under the bed storage is the perfect solution. This is pretty easy to build, and it rolls right under the bed. Little ones can easily pull it out when they want to play with their stuffed animals and then roll it right back under the bed when it is time to clean up. Those empty milk crates, or plastic crates, are perfect for helping your kids to keep their stuffed toys organized. You can stack them up and use them like a bookshelf or you could even attach them right to the wall. And, the colorful crates are already decorated, or they are super easy to remake with a can of spray paint. This is a great idea that serves the purpose and is really cheap, too. 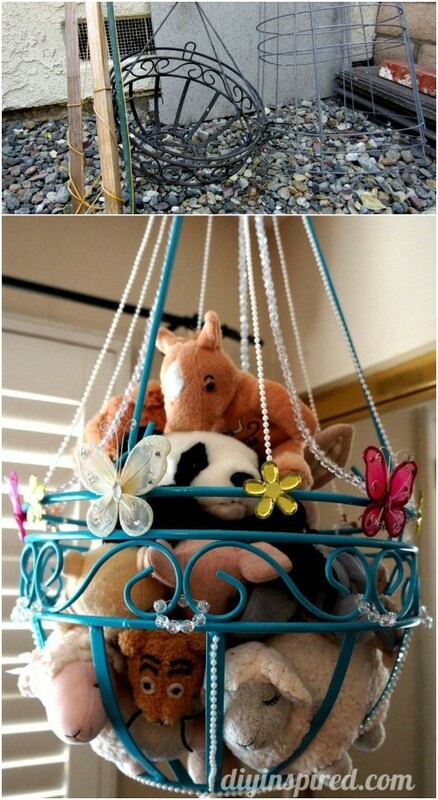 A cheap wire hamper is great for keeping all of those stuffed animals put away. You can get these at just about any home décor type store and Walmart normally has them pretty cheap, too. Or, check with your local thrift store. They often have things like this for just a dollar or so each. 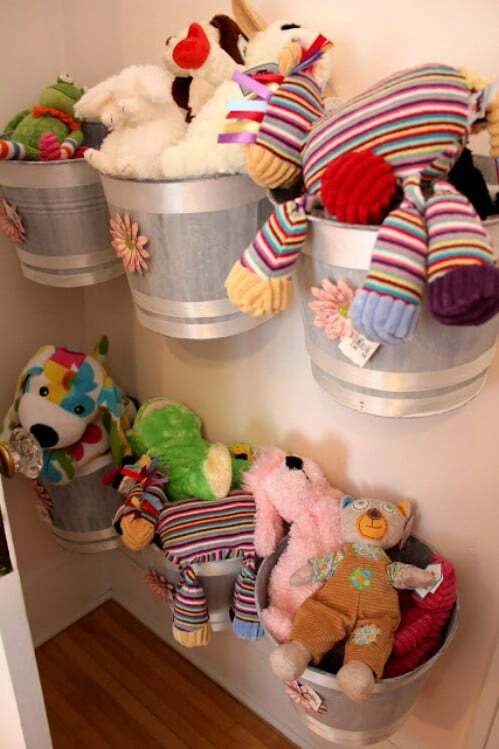 The hampers are pretty tall, so they will hold quite a few stuffed animals and you can stick it in the closet or hide it behind the bedroom door to keep it out of sight. 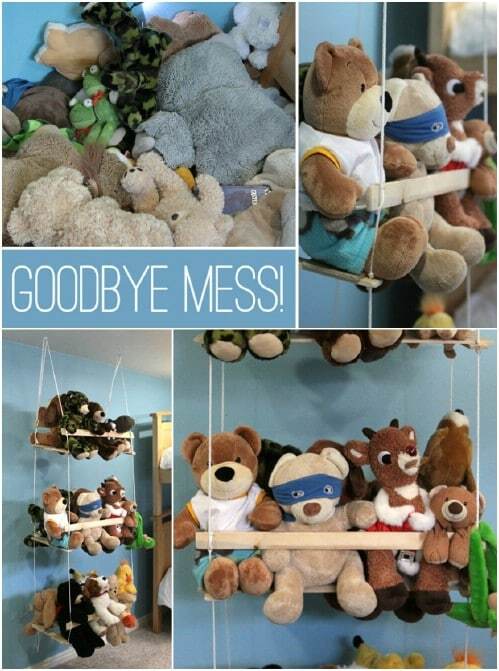 This DIY stuffed animal swing is almost too adorable, and it is really easy to make. You need some rope, clothesline or twine for this one and some boards in a couple of different sizes. If you happen to have some wood left over from other projects, this is a great way to use it up. You just build little swings and they hold the stuffed animals up on the wall and off the floor. Not only is this one great for storage, kids will love the look of it. You could even use sticks and twigs to make this one look a bit more rustic. 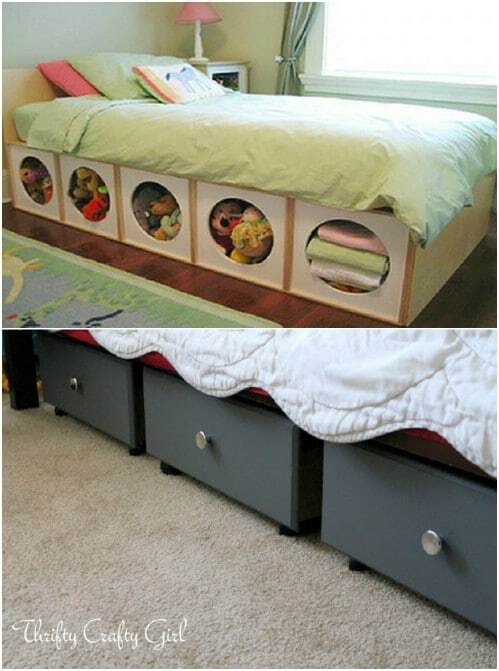 Here is another great under the bed storage idea that will help you to get those stuffed animals organized. This one makes it super easy for kids to get to their toys and put them back when they are finished, and it adds a great decorative look to their bedroom. To make this one, you can use old dresser drawers or anything that you can add casters to. You can also use plywood to create this great front that has round sections where the animals will live.